A Mortgage Capacity Assessment Letter is a report on how much you would be likely to get if you were to apply for a Mortgage based on a set of circumstances. The letter is more thorough than just visiting your bank as we will check with a number of lenders and ensure the figures entered on the affordability calculators are correct. Mortgage Capacity Assessment Letters are usually needed for divorce hearings where you need to evidence how much you can obtain for a Mortgage. As we are qualified and regulated Mortgage brokers, the letter we provide will be on our letter headed paper, accurate and should hold more weight than a print out from your bank. The amount you can obtain from various lenders can alter significantly. 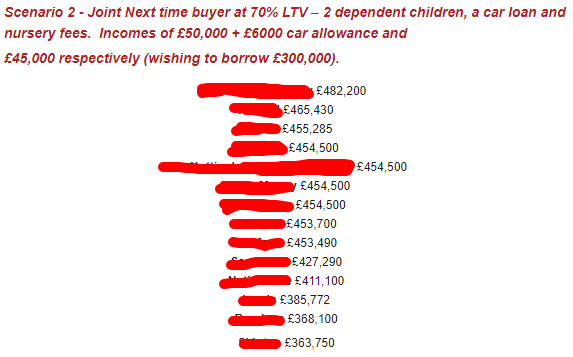 Below is an example of how one particular scenario can result in over £100,000 difference from the highest lending lender to the lowest. Where your income is not from a main basic wage – but also things like maintenance, bonuses, benefits etc, the amount of those income sources lenders will use can vary – some will use 100%, others 50% and others will noly use it if there is a year or 2 evidence of it being received. If you put these figures in incorrectly at the outset, it will mean you get incorrect Mortgage figures at the end. We will go through a short questionnaire with you (it will take around 15-20 minutes) in order to get your circumstances down on paper. The Assessment letter will be provided to you and only you – unless you ask us to send it elsewhere. You can then pass the letter on to the courts or the other party if you wish. The letter will be written for you and your circumstances. If your circumstances will change following the proceedings (ie an increase/decrease in hours worked, benefits received, childcare costs etc) then we can provide a letter to confirm how much you can obtain in various circumstances. The letter will cost £150.00 for single set of circumstances or £185.00 if you would like up to 3 scenarios on the same Mortgage Capacity Assessment Letter.